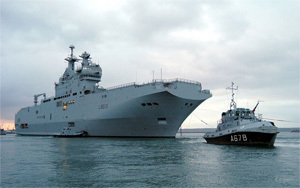 The plans to procure a French-made multipurpose amphibious ship (MAS) for Russian Navy discussed in the summer are being proved out – Russian Ministry of Defense officially reported of intention to purchase Mistral-type MAS and with technical assistance of France to construct under license three ships of that type at Russian shipyards. That contract – if it would be signed – is to be outstanding event on worldwide market of arms. First, because of its price – building cost of four ships will exceed ˆ1,2 bln. Second, because of the fact that Russia has been avoiding importing such huge military items up to now, confining itself to purchase single parts and technologies. The plans of the Ministry of Defense aroused stormy discussion with opposite appraisals. Let us try to understand what the point of that bargain is. From the viewpoint of many experts, one of the main reasons made Ministry of Defense address to foreign suppliers was depressive condition of Russian shipbuilding science and industry which is not capable to design and construct a sufficient number of ships after collapse in 1990-ies and beginning of 2000-ies. This situation may and must be changed but it needs long time. However, the ageing of naval ships does not give that time. Overwhelming majority of in-service ships will be written off in 10-15 years, whereas complete cycle from the beginning of ship designing to acceptance of lead ship lasts not less then 10 years. In the number of cases Russia has already have new projects ready to be executed and used for construction of lead ships and planning of full-scale production. However, in the case of MAS we have another situation. Russia does not have adequate and ready-to-construct ship project of this class – unrealized Soviet MAS project 11780 was created over 25 years ago by obsolete technology and needs complete redesigning. If the decision of such redesigning is made immediately, the Navy will get the lead ship of new project not early than in 2020, whereas the French-made ship – if the contract is signed by the end of the year – may be integrated into naval forces in 2014, and by 2020 1-2 Russian-made ships will be in service. The ships of that class are essential for the Navy. Available amphibious ships park primarily consisting of Poland-made combat units built in 70-80-ies is rapidly getting old. At the same time, experience shows that Russia needs battleworthy Marine units having full range of amphibious facilities. These units are required not only for the case of possible aggravation with neighbors (like the 5-day war in August, 2008) but also for remote operations, particularly for anti-pirates warfare. Amphibious ships are more appropriate for that purpose and are more cost-effective tool than large antisubmarine ships sent to Gulf of Aden by Russia. What are the ships which Russia is planning to buy? Mistral has a displacement of 21 000 t while its length is 200 m and width is 32 m. The ship is based on classic concept: with pass-thru flight deck and displaced to the right board deck erection – "island". The vessel is capable to carry up to 900 marines or up to 40 tanks, 15 heavy or 35 light helicopters; and also assault boats and barges in the stern dock. Full speed velocity of such ships is 19 knots and operational range on economic speed is 20 000 miles. The concept of such ship was first used in the US during Vietnam War, when US Navy met with a problem of interaction among different kinds of assault ships. All of them executed various functions – dockships carried landing facilities, tank landing ships transported ground vehicles. Marines were placed on other ships and transported by helicopters based on heli-carriers rebuilt of obsolete Essex-type aircraft carriers. Moreover, the US Navy then faced a problem of marines' uncoordinated actions ashore. MAS are capable not only to launch an assault but to support it from the air. In cooperation with missile ships MAS is becoming a core of expeditionary attack group capable to engage in small war independently. Alongside with that, despite evident advantages of MAS concept the probable purchase of such ship will cause a number of questions. The first is how new ship will fit in existing shipbuilding program and generally in Russian Navy image. The purchase of a single ship of such type without technology transfer is certainly meaningless – the "series" consisting of one ship have made lots of troubles to the native Navy. In this connection the most important are those contract articles providing construction of the ships at Russian shipyards with French assistance. Additionally, the question of consorts necessary for such heli-carrier arises. Presently there are too few naval surface ships being under construction, whereas it is necessary to have 15-20 ships of corvette-frigate class to form 3-4 expeditionary groups for corresponding amount of MASs, exclusive vessels for other tasks. Meanwhile the building program gives no hope that the Navy soon will receive necessary amount of new combat ships. Only one hope remains that the plans to launch large-scale construction of naval vessels will be fulfilled in the years coming. Finally, multipurpose amphibious ships as all 1st rank combat units require well-developed infrastructure – from docking facilities to auxiliary vessels – which must be built as well. Consequently, purchase of Mistral and mass production assimilation of such ships in Russia will be a sort of challenge – whether current Russia is able to revive its Navy and keep it on adequate level or not.